All of my plumbing runs through copper lines in an accessible attic in a 1960's slab-on-grade ranch style home in Phoenix, AZ where I don't need to tell you how hot the attic can get for a huge chunk of the year. This results in having to run the cold water for about 2–3 minutes to get water that isn't scalding hot—and this "cool-down" of the pipes only lasts for maybe an hour before you have to restart the process as the pipes have heated back up again in the attic. I know insulating the pipes will not entirely solve the problem as I will just be slowing down the heat transfer, but I'm trying to get some sage advice on whether it will be at least marginally effective (enough to justify the work) to insulate my water pipes. They sell polyethylene (pool noodle) pipe insulators here in the big box stores, but I also noticed a fancier version online which has a fiberglass interior with a foil-like radiant heat barrier and wondered if this would be better? Any advice or experience would be greatly appreciated. I've done a lot of searching online but can't find anything to answer my specific question. update (12Sept2018) Thanks for all your answers and help everyone—I finished this project and wrapped the entire cold water line in the attic with the "pool noodle" type insulation. It made a noticeable difference in my house immediately. During the eight hours I am at work and no water is running through the pipes to cool them down the water still gets scaldingly hot, but once you run cooler water through the pipes it takes much longer to heat back up again to scalding (now it takes around 4–5 hours to heat back up rather than an hour like before). I have a temperature probe in the attic and during June/July it gets above 130F in the attic so there's a lot of heat to fight against. I wanted to post this as a follow up comment to mmathis answer, but it got too long so I have to post it as a standalone answer. At it's core insulation fights to keep cold things cold and hot things hot. The problem is it's constantly losing the fight. That's why no matter how well you insulate your home in Phoenix AZ you're still gonna have to run your ac sometime. The main question to ask in regards to insulation is how "quickly" it will lose the fight. This can be determined by the insulating materials "R" value. The higher the R value the longer it can keep your pipes cold before the heat from the attic transfers back into them. This chart below represents the idea of how this works. Notice as the red bars increase (the R value) the blue line decreases (how quickly heat transfers). However also notice from the chart above that the more insulation you stack on the less you proportionally benefit. It's like the law of diminishing returns. In your case this will actually work for you, because your copper pipes have very low R values, practically nothing. The only thing that keeps your water cold for an hour is that water in itself is hard to heat up or cool down, but your pipes are worthless in helping maintain temperature. 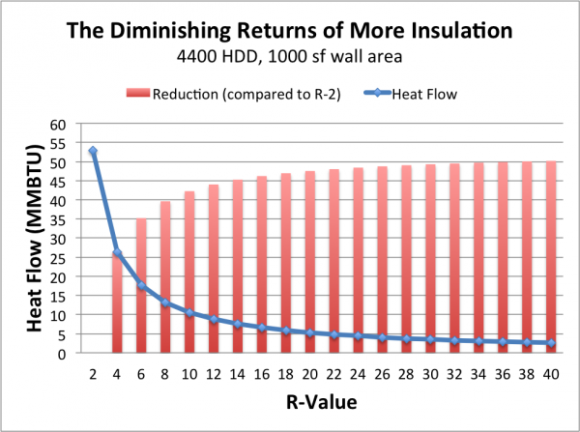 This means that insulating your pipes with a cheap low r value insulation should warrant you some good results. If you are getting 1 hour of cold water with no insulation, cheap insulation might bump you up to 3 or 4 hours. The better insulation might give you 5 hours, but it would get harder and harder to increase that number from there. At first glance this may not seem worth the effort because the water will still heat up, but if you really think about how often you run the water in y our house (showers, cooking, flushing the toilet ect...) odds are you'll experience the hot water problem much less frequently. This is the same theory behind insulating the hot water pipes in attics in cold climates (freezing concerns aside). It'll help but only for a little while. It might extend your hour-long window of continued cold water to 2 or 3 (or more) hours, but you won't keep cold water all day long. If your attic is easily accessible, the pool noodle pipe insulation is cheap enough and easy enough to install for this to be a good trial. Not much lost if it doesn't work out. If that trial goes well, then you'll want to consider if more expensive solutions are worth the time and effort to install. Not the answer you're looking for? Browse other questions tagged water insulation pipe attic copper or ask your own question. Can I install a hot water recirculation pump if I have a reverse osmosis filter? Hot water pipe sticking up in back yard? Should I run the tap while dumping boiling water?